If you are under 50, you may not be familiar with the Eleventh Commandment. The Eleventh Commandment was created by the California Republican Party and popularized by President Ronald Reagan. The Eleventh Commandment reads, “Thou shalt not speak ill of any fellow Republican.” If you have watched any of the Republican debates, you are aware that the Eleventh Commandment has died a violent death. Holly Robichaud, who writes a column for the Boston Herald, posted her observations on the subject in today’s Boston Herald. Where is the Republican National Committee Chairman Reince Priebus? He is the leader of the Republican Party — not just the establishment wing. It is time for him to lead the entire party by stopping the civil war. There have been plenty of times when conservatives have been less than thrilled to vote for the Republican nominee, but once the selection had been made there was no ranting or raving about our objections. We kept our nose-holding to ourselves and loyally supported the nominee. The establishment is having a massive hissy fit over the Trump candidacy. They are not helping the other Republican presidential candidates. They are only hurting our chances to win the White House in November. Shame on them for their self-indulgent whining. As I have stated many times before, Donald Trump did not get my vote in the Republican primary (North Carolina has early voting, so I have already voted). However, if he wins the votes in the Primary Elections around the country, he is entitled to the nomination. The maneuverings of the establishment Republicans are amazing. They have ignored the party’s base for years, and now wonder why the base is choosing to ignore them. Earlier in this election cycle, Priebus got Trump to sign an agreement to not run as a third-party candidate if he did not win the primary. Was it a one-way agreement? Where is the protection for Trump? He’s winning these primaries fair and square. It wasn’t even close in Massachusetts. Priebus is going to be the last chairman of the Republican National Committee if he doesn’t stop the establishment’s temper tantrum. What could Priebus do? First and foremost, he needs to shut off all money to people who speak ill of the soon-to-be nominee. That will motivate them. Second, Priebus can give them a collective dope slap. To suggest that Trump would be a lousy president due to some business failures is beyond ridiculous. According to Forbes magazine, 8 out of 10 businesses fail within the first 18 months. Businesspeople have successes and failures. On the other hand, Hillary Clinton should be indicted over the email scandal! On her watch as secretary of state, four Americans died because she refused to act! The Clinton Foundation is a disgrace! The Republican Party is in danger from its own establishment. The establishment that has gone along with higher taxes, more spending, and not using every weapon available to fight ObamaCare and executive orders is reaping what it has sown. The Republicans hold the House and the Senate. Does anyone believe that if the Democrats held the House and the Senate that they would not manage to advance their agenda? If the Republicans continue to avoid success and replace it with whining that they cannot do anything because of President Obama, they deserve to be removed from whatever office they hold. Attacking each other only adds to their problems. If the republican leaders continue to act in a way that ignores the base and encourages attacks against the leading candidate, they may find themselves without a party to lead. Taking Care Of Their Own???? The Daily Caller posted an article today about the Master Agreement between the Veteran’s Administration (VA) and the American Federation of Government Employees (AFGE). It is a truly amazing agreement. Veterans are supposed to get “preference points” against other applicants under federal civil service hiring rules. At the VA, such points are apparently negated by a hard-and-fast rule that a job can’t go to anyone unless no qualified union member wants it. The Veterans Employment Opportunities Act (VEOA) also allows vets to apply for jobs that are otherwise only open to current employees. Thanks to the union contract, it is futile for them to apply — at least for plum positions — because the VA must consider union members first. This is an example of another government agency that has lost its purpose. The article goes on to explain that many of the good jobs in the VA are not open to veterans. Ryan Honl, a veteran who worked at the VA hospital in Tomah, Wisc. before becoming a whistleblower by telling Congress about the mistreatment he witnessed in the facility, told TheDNCF that “VA’s first objective was to originally ‘care for those who have borne the battle.’ Today, the VA’s original mission has become secondary. Its primary mission is now to serve bureaucrats and those in power” by sustaining high-paying administrative jobs for civilians. Since Honl voiced his concerns, VA employees have threatened to sue and discredit him. They even by made his personal medical information public. It’s time to clean up our government. That wasn’t Newt Gingrich, or Ron Paul, or Ronald Reagan talking. That was George Meany — the former president of the A.F.L.-C.I.O — in 1955. Government unions are unremarkable today, but the labor movement once thought the idea absurd. Cleaning up our government is going to involve getting unions out of the public sector. Unfortunately the mainstream media in America has become the spokesperson for the Democrat Party. Things are reported or not reported according to the impact they will have on the success of that party. On March 8, New York Magazine posted a story about the problems at NBC that led to the dismissal of Brian Williams. The actual definition of divisive is having a negative impact on a Democrat. Today Newsbusters posted another example of how the American mainstream media works. Despite the networks’ eagerness to tout Democratic opposition to the GOP letter (the letter stating that the Senate should weigh in on any agreement with Iran), on two separate occasions the “big three” completely ignored a letter penned by former Senator Ted Kennedy (D-Mass.) written to the Soviet Union in 1983 aimed at undermining President Ronald Reagan’s nuclear negotiations with the Communist regime. The Republicans who signed the letter are reminding the President of the Senate’s role in approving treaties. They are asking the President to respect the separation of powers in the U.S. Constitution. Ted Kennedy was asking the Russians to get involved in an American election. It seems to me that the latter is much more significant than a reminder of how the U.S. Constitution works. In 2010 I attended a family reunion in Northern California. Because my military family was stationed near San Deigo, we made the drive up the Five. 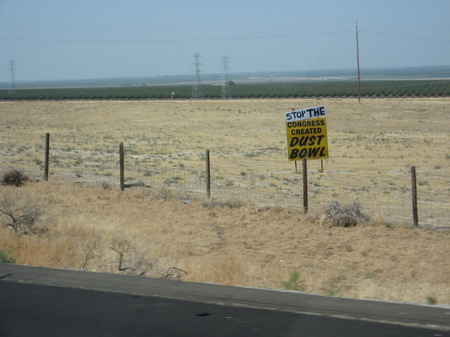 One of the things we saw was the impact of the Congress-imposed drought on the Central Valley, formerly the breadbasket of America. The story hasn’t gone away. The picture below of the Central Valley was taken during that drive. Today National Review Online posted an update of the story. The soil being uncharacteristically fertile and the summers being long and dry, growers are afforded that most valuable of things: control. Emancipated from Gaia’s caprice, farmers here can determine precisely not only how much water they wish to provide to their crops but when to add it, too. Which is to say that, in the Central Valley, irrigation is achieved not by the whimsy of the sky but by deliberately placed pipes, pumps, and microprocessors. It is here that the ancient earth meets the best of technology; where Silicon Valley meshes with the baser elements and, together, they yield life. “If the Pilgrims had landed in California,” Ronald Reagan liked to joke, “the East Coast would still be a wilderness.” Undoubtedly. I suspect fewer Pilgrims would have died, too. Make no mistake: This place is a miracle — a vast greenhouse in which, unmolested by the elements and provided with incomparably fecund terrain, farmers can do their thing as never before. But the miracle has a problem. On the Harris Ranch in the Central Valley, 9,000 of the 15,000 acres are fallow because of lack of water. And much of the breadbasket became a dustbowl. Please follow the link above to read the entire article. It is a study in governmental destruction of a natural resource–America’s breadbasket. And so nothing happens. Each year, farmers sit and wait — praying for rain, and hoping that the federal government will send them a few drops of water so that they do not have to leave perfectly good land fallow and tell their employees that this month there will be no work. Of all our present troubles, California’s farming woes are perhaps the most inexplicably sourced and the most easily fixed. Complacently convinced of their infallibility, legislators in the nation’s richest state have prostrated themselves at the feet of many silly ideas in recent years. But for authorities to have put the livelihood of millions of citizens at the mercy of a tiny little fish is almost too much to bear. We need a little common sense with our environmentalism. The U.K. Mail is reporting today that Britain’s Iron Lady, Margaret Thatcher, died this morning. I am citing the U.K. Mail article because it includes a lot of pictures of Prime Minister Thatcher during her time as Prime Minister and after she left office. Lady Thatcher, along with President Reagan, stood up to the Soviet Union, and eventually the Soviet Union collapsed. Lady Thatcher was Britain’s first and only woman prime minister. She won three consecutive general elections to that post. Please follow the link above to read the article in the U.K. Mail. It is an inspiring story of a lady who broke the mold when it came to British politics. For those of you who are not in shock by the fact that Marco Rubio actually took a drink of water, here is the video and some highlights from his speech Tuesday night. …This opportunity – to make it to the middle class or beyond no matter where you start out in life – it isn’t bestowed on us from Washington. It comes from a vibrant free economy where people can risk their own money to open a business. And when they succeed, they hire more people, who in turn invest or spend the money they make, helping others start a business and create jobs. …This idea – that our problems were caused by a government that was too small – it’s just not true. In fact, a major cause of our recent downturn was a housing crisis created by reckless government policies. …And tonight, he even criticized us for refusing to raise taxes to delay military cuts – cuts that were his idea in the first place. The reason that a lot of the media has focused on Senator Rubio’s drink of water is that they don’t want you to hear the wisdom in the speech.